I use it in my hair: Every once in a while I i take a scoop of coconut oil and rub it into my hair. I try to do this about once every two weeks or so. I usually rub it into my hair and by bed time I plait my hair and sleep as is. In the morning I then I wash and style my hair as usual. This leaves my hair soft, moisturised and shiny. I have heard some people mentioning the smell but for me this has no smell at all. In fact I have not once got a whiff of coconut while using this for anything. I use it on my face: I don’t this this instead of my usual skin care routine but I use it in conjunction with it. Up until now I have used it about once a week but with the colder weather I seem to be using it more often. There is nothing worse than dry, tight skin and when i apply just a tiny bit of this oil it makes a word of difference. Don’t for one minute think this will leave your skin oily. It really soaks into your skin and goes to work. When i was my face at night I use my normal skin care products and use my regular night time moisturiser. Just before I go to bed I will rub some oil into my face and voila! I use it on my body: You know those dry patches that are prone to become flaky? Like elbows, knees etc. I use coconut oil on these dry patches before or after my usual body lotion. Once in a while I will use coconut oil as body lotion. This means I rub it on my legs, arms and body. Once again, it doesn’t leave me oily for days. In fact within a few minutes it is already absorbed into my skin with just a slight ‘oily’ feel. Even that doesn’t last long. I also once in a while add a dollop in my bath water. I find it much better than other bath oils or even baby oil as it doesn’t have that oily texture. This leaves my skin feeling moisterised and silky soft. I use it on my hands and nails: I have mentioned before that I have a slight obsession with hand lotion. I hate dry hands. I use hand lotion often throughout the day but sometimes you need just a little bit more. With the colder weather or even just if you have your hands in water often. I rub coconut oil into my hands at night and it makes such a difference. I also use Tip Top Cuticle oil daily. I do however also rub the coconut oil into my cuticles when I do my hands and it really moisturises my cuticles and keeps them soft and smooth. I don’t know if it has any additional benefits like the cuticle oil does but I do know it keeps my cuticles soft and moisturised. I will continue to use the cuticle oil for the benefits to my nail matrix and the health of my nails as well as the coconut oil for extra moisture. I use it for my nose. This doesn’t happen often and I hope I don’t have to use it soon. When I am sick and my poor nose gets man handled by tissues it gets very raw and tender. I then rub coconut oil on the raw and tender parts and it really helps. I use it on my lips. I will admit I don’t use this often but only because of convenience. I don’t carry coconut oil around with me so when I am not close to it I tend to use my balm but every time I walk past the tub I dab a little on my lips. It definitely leaves my lips moisturised for longer and makes them soft and smooth. I brush my lips with my tooth brush every time I brush my teeth so I don’t really have any flaky patches in general but I am almost certain this would help as well. I have to say this again. I often hear people talk about the smell. 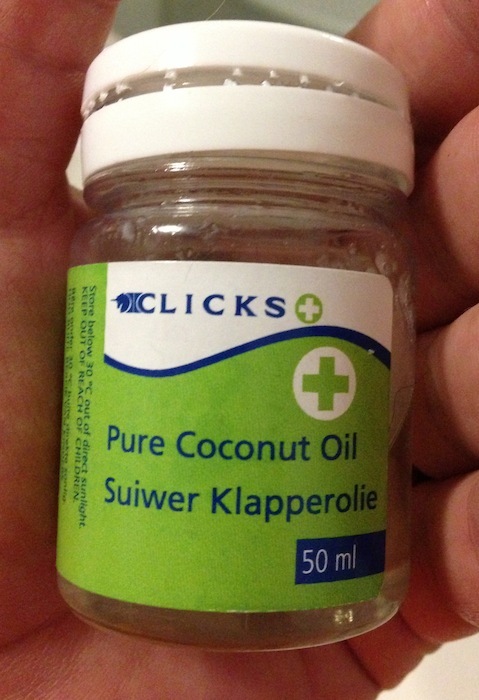 I have ONLY used the Clicks Pure Coconut Oil and I have never experienced any smell. Not a coconut smell or any other smell. This is my experience. That is by no means all you can do with coconut oil. I have heard people use it for cooking, use it as a shaving balm when shaving your legs, use it as a make up remover and even for burns or insect bites. I am totally in love with my little tub of goodness. I am also blown away but not only the great ‘cosmetic’ uses for coconut oil but also the health benefits. If you want to read more about all the great benefits of coconut oil all you have to do is search “Coconut Oil”. Here are just two links for a great place to start. Remember, there are many different brands and types of coconut oil. Please make sure you know which one you use and if it is suitable for some of the uses. For example, I don’t know if the coconut oil I use is suitable for cooking. Also, please check on the purity. You don’t want coconut oil that isn’t just coconut oil. If it has any other additives then make sure you know what it does as well. If you haven’t tried coconut oil yourself yet then I would suggest you give it a shot. I am finding new and different uses for it every day. Every time something comes up I wonder if I can use coconut oil and if it will help (like when I burn myself). Try it and let me know what you think! coconut oil is great – it really does have so many added benefits. I on the other hand love the smell, but I have never used the Clicks version. When my boy got burnt last year the Pead Surgeon put us onto coconut oil to rub into his scars every night and honestly, there is such a huge difference if you had to do a before and after coconut oil. I also have an existing face routine. As I mentioned I don’t use it instead of but in conjunction with my regular face routine. It really helps with a blast of moisture every now and then. I grew up with using it in our hair. My mom has always used it like a masque almost. I’m going to try your method on my Sunday nights. Do u just take a dollop and rub in or what? Or must I braid first then rub in? Smell has never bothered me because I love the smell of coconut but the clicks coconut oil that you have, we have too and that doesn’t really have much of a smell I feel. It is obvious I like coconut?! I believe Dischem is selling coconut water. Every one is raving about it so I have to try it!! Thank you so much for sharing about coconut oil. I heard people talking and talking non-stop about it that it does wonders, so i decided to get one for myself from Clicks, and when I googled online its uses I bumped into this post well I knew I was at the right place. I’m gonna use it on my super dry face, that now its the time of an annoying cold weather I surely gonna use it religiously!